Big Data & Data Science Blog: Are you Ready for a Wild World? 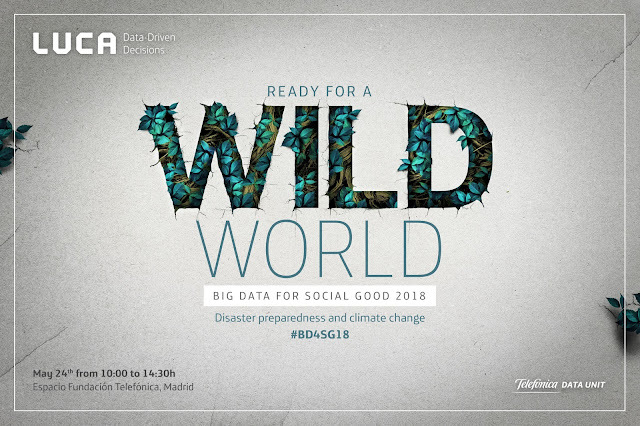 Don't miss out on Big Data for Social Good 2018! Are you Ready for a Wild World? Don't miss out on Big Data for Social Good 2018! Although we often associate Big Data with worries such as security and privacy in our daily lives, it's also important to highlight the enormous potential that data offers when it comes to the quality of peoples' lives. This is what we call "Big Data for Social Good"
As such, the possibilities are endless! In this new digital era, decision-making based on data is a fundamental pillar of successful organizations. Using macrodata for social goals (Big Data for Social Good) allows us to do our bit to help improve our environment, but also to build a society that is more fair and sustainable. In this way, at Telefonica we are committed to giving back the value of data for society's gain. To do this, we have chosen to use our own data, alongside external data from private and public companies, to drive progress and guarantee a better future. Telefonica is fully committed to achieving the Sustainable Development Goals by carrying out a number of projects and initiatives that positively impact our society. Big Data can truly be a catalyst for change and can contribute to the majority of the Sustainable Development Goals set by the United Nations. These goals aim to guarantee a more equitable and environmentlally-friendly development, with special focus on reducing the human-caused dangers of climate change and reduce extreme poverty. The ability of data to achieve this goes much further than isolated projects where data plays a key role. We can improve agricultural productivity (Objective 2), traffic management and mobility control (Objective 11), improve business efficiency (Objective 9) and control the spread of diseases (Objective 3). Data can help us achieve each and every goal, by allowing us to analyze the current performance and improve decision making at both a business and national government level. International organizations have already realized the potential of the data economy for the common good. This year at the Mobile World Congress, GSMA launched the "Big Data for Social Good" initiative with the objective of strengthening the collaboration between mobile operators in order to use their data to predict and manage global crises, such as epidemics, contamination or natural disasters. In the same way, we are working on projects with organizations such as FAO and UNICEF, where the deep analysis of data contributes to preparing for natural disasters and the effects of climate change. Currently, there is a general consensus that Big Data for Social Good should be treated as a collaborativ tool where private and public bodies that data in order to generate social benefits. In fact, the 17th Sustainable Development Goal is "revitalize the global partnership for sustainable development". There is special importance for those alliances that share data of diverse types (mobile, financial, satellite images etc) and that incorporate the agencies that will use the tools generated. In this way, a valuable cycle is created where the providers of data and analytics design the solutions alongside those who demand them. Another fundamental aspect is development of sustainable initiatives over time. Initiatives should include a viability plan over medium and long-terms, thus going further than the reach of "Proofs of Concept", and should guarantee the availability of the service for those who use the tools (humanitarian organizations and governments). A year ago we celebrated our first event where we debated and explained the problems and opportunities of Big Data for Social Good. We were joined by top-class speakers from different global organizations such as UNICEF and BBVA, who showed that the use of macrodata to make the world better is no longer an idea, but a reality. This wear we take on the challenge once more and will be debating the use of data in order to take on the challenges of climate change and to prepare for natural disasters which are themselves often caused by climate change. We have designed a schedule that includes speakers from global organizations such as GSMA, FAO, Data-Pop Alliance and DigitalGlobe, who will share their first hand experiences of the problem with a particular focus on data-based decision making. For Telefonica's part, we will delve a little deeper into one of the fundamental challenges in many parts of the world; connecting the unconnected. The event will be made up of a series of 30 minute talks in which each speaker will show us how their organization has taken on the challenges. It will conclude with a panel discussion in which we will share ideas about the sustainability of these types of initiatives. The event will take place on the 24th of May at the Espacio Fundación Telefonica, location at Calle Fuencarral 3, Madrid. The event will also be available via streaming for those who are unable to attend in person. We look forward to seeing you! You can keep up to date with all the latest news on the event's website! ¿Cómo se mueven los trabajadores de Distrito T?